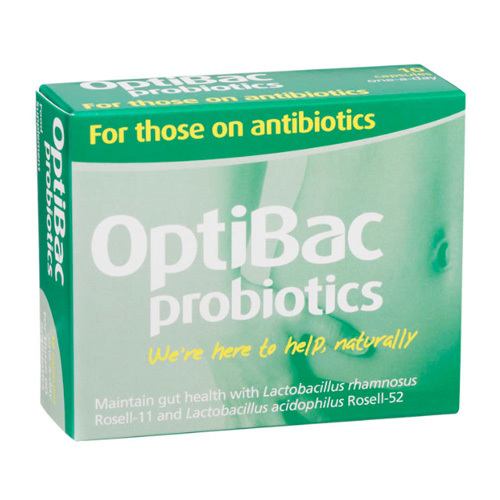 OptiBac Probiotics For those on antibiotics is a natural supplement containing two carefully selected, high quality strains of live microorganisms Lactobacillus acidophilus Rosell-52 and Lactobacillus rhamnosus Rosell-11, which are very well researched and clinically proven to survive stomach acidity and bile salts to reach the gut alive, even during a course of antibiotics. For those on antibiotics provides 4 billion live cultures per capsule. It is free from sugars, fats and flavourings that may be found in other supplements and drinks containing live bacteria. The two quality strains in this product have been scientifically tested and shown to be safe to take during a course of antibiotics. Filler: potato starch; vegetarian capsule: hypromellose, titanium dioxide; Live cultures: (Lactobacillus rhamnosus Rosell-11, and Lactobacillus acidophilus Rosell-52); anticaking agent: magnesium stearate; antioxidant: ascorbic acid. Take 1 capsule daily with food, preferably with breakfast*, every day during antibiotic course and preferably for one week after, or as professionally directed. Continue taking until pack is completed and add a second pack if the antibiotic treatment lasts more than one week. This product has been scientifically researched alongside antibiotics, and can safely be taken at the same time as antibiotics. 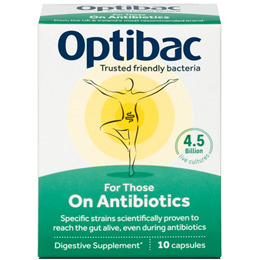 Below are reviews of OptiBac Probiotics - For those on antibiotics - 10 Capsules by bodykind customers. If you have tried this product we'd love to hear what you think so please leave a review. A recent course of antibiotics left my gut feeling not so happy. A couple of days on these probiotics and I felt back to normal. I hope I don't need antibiotics again but, if I did, I would definitely take them. Highly recommended. It's a great product. I take these every time I take antibiotics. I believe it's vital to replenish your good bacteria during and after a course of antibiotics. I highly recommend this product. Antibiotics zap gut bacteria both good and bad. This product gives you a chance to start off again with good bacteria as the basis. By starting off well and continuing to eat well maybe the bad bacteria will be less likely to repopulate. Took these probiotics along side amoxicillin and erythromycin for a dental abscess .After two weeks I found my body began to itch in areas. After further research I read that this may be a side effect from taking any probiotic. I have however purchased more of this product as a precaution to make sure I have something to take if I need more antibiotics. Currently taking shop bought probiotic yogurts which I enjoy although I am unsure if the number of probiotic strains would be enough to work along side antibiotics. What a fantastic little find. Getting thrush used to be a normal part of taking antibiotics for me. However taking this alongside the my last course worked an absolute treat. I avoided the usual side effects, and even recovered quicker from my cold - perhaps thats because i was so relieved!